Ross Mayfield writes about the right momentum you need to build your start-up or project. The author encourages leaders to especially look out for internal momentum such as a good team, and take the chance to use that. Momentum. Another helpful and related advice for start-up founders has Auren Hoffmann on Quora. Deriving from sports, he draws a general distinction between the “Position player” and the “All-Around-Athlete”. Both – the highly specialized employee as well as the multi-talented one – are required in companies, but they are needed in different situations and phases of the company: How do you avoid hiring the wrong people for your startup? What can we do to drive our inspiration and prevent us from getting blocked in our work? Get out, read, have fun, be open! Problems of Output are Problems of Input. You want to start your own business but have no desire or time to write a 60 pages long business plan? The Lean Canvas for business planning is a handy tool to track your progress and keep stakeholders on board. How to Run More Effective Board Meetings with a Business Model Progress Timeline. This articles analyses how our understanding of the human nature shapes current workplaces and why this leads to unsatisfied humans. It has an illustrating example how economic incentives destroy the moral grounds of decent behavior. The author pleads for shaping workplaces that motivate people to do the (morally) right thing instead of the economic right thing. Psychologist Barry Schwartz on What Motivates Us to Work, Why Incentives Fail, and How Our Ideas About Human Nature Shape Who We Become. John Stepper asks why especially Germans are interested in Working Out Loud. He points out that it doesn’t depend on Nationality: “They share the universal intrinsic motivators of autonomy, mastery, and purpose, and they feel working out loud can give them more control over their work and life while increasing their access to learning and their sense of connectedness.” Why Are So Many German Companies Interested In Working Out Loud? Die Bahn als innovatives Unternehmen? Im so genannten d.lab wird seit April kräftig experimentiert und entwickelt, um eine “Verbesserung des Kundenerlebnisses” herbeizuführen. Geschäftsführererin Kerstin Hartmann erklärt im Interview genauer, wie das gehen soll: Im Bahn-Labor der innovativen Ideen. In der Ideenschmiede kann man übrigens mitmachen, vielleicht die Chance, gelegentlichen Bahnfrust in “konstruktive Bahnen” zu lenken? 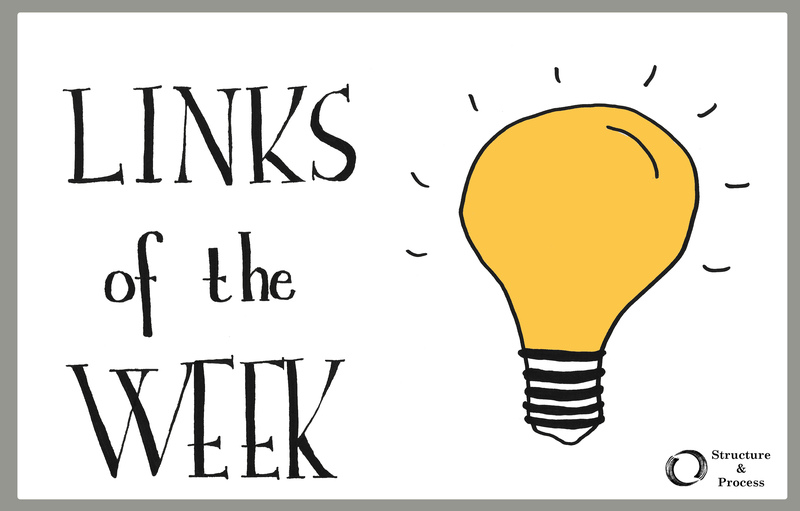 Here are our Links of the Week, with a special focus on Holacracy this time, curated from our link collection. In Unlocking the Benefits of Self-Management Without Going All In on Holacracy, Mike Arauz, a Co-Founder of August, describes the lessons they have learned from Holacracy without relying on the system in their new company. Ever wondered how to make the transition to a new organization model like Holacracy? In Holacracy at BSL: Moving Forward Denitsa Marinova shares her experience of a workshop with a Holacracy-trained coach as the first step.